IInnovation is at the heart of our philosophy and is driven by our enduring commitment to provide surgeons with only the highest quality reusable titanium ophthalmic instrumentation. We are proud to announce and unveil our latest line of instrumentation, the “E-Range”. This range represents the application of cutting edge technology fused with over 60 years of engineering knowledge. 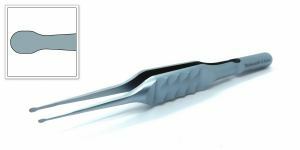 These instruments offer surgeons an elegant, well balanced and ergonomically designed handle while still providing our high quality, consistent and durable functionality. Designed to fit comfortably through any incision down to 1.8mm. 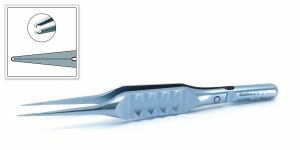 Precise interlocking serrated tips with a sharp point enable the surgeon to initiate the capsule tear then securely grasp the capsule to perform the capsulorhexis. 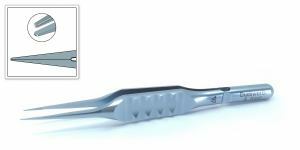 Designed specifically for corneal placed incisions, tip to pivot length reduced to 9.5mm. Keeping the pivot in the incision reduces the leakage from the anterior chamber, it also enables the tips to operate fully at the smaller incision sizes without stretching the incision and causing corneal deformation. Accurate capsulorhexis size is crucial for optimal IOL function. 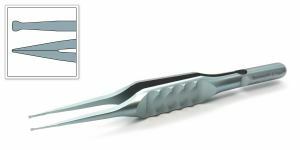 The new Inamura cross action capsulorhexis forceps have an engraved scale from the tip to 2.5mm and 5.0mm along the shaft. 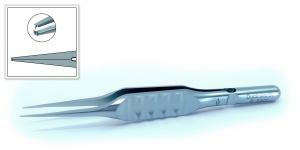 The scale enables the surgeon to repeatedly measure the size of the capsulorhexis using the forceps within the anterior chamber. Measuring on the cornea surface overestimates the actual size of the capsulorhexis when measured within the anterior chamber.